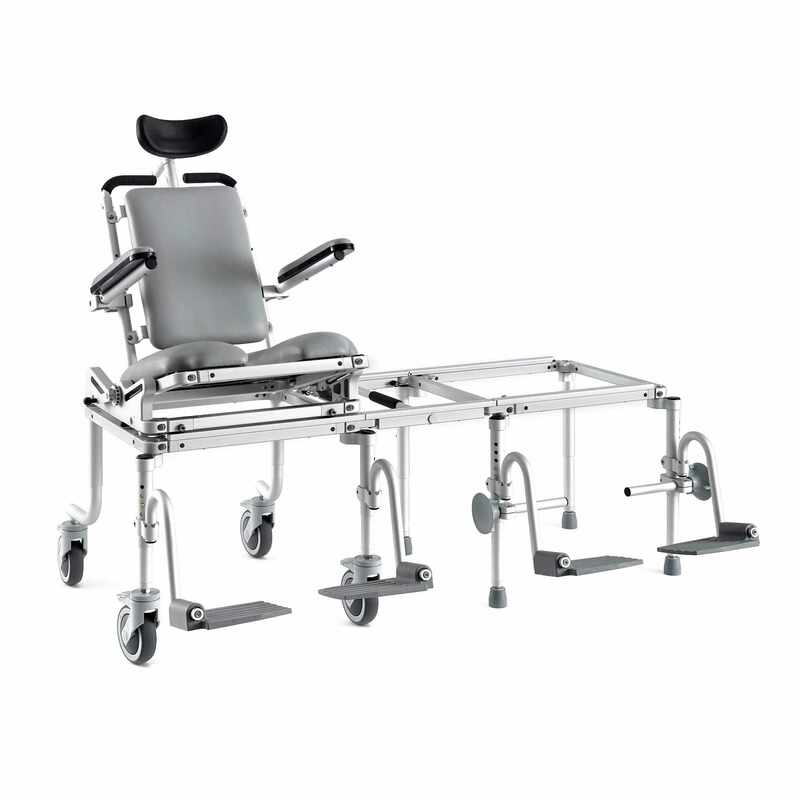 Nuprodx multichair 6000tilt pediatric tub slider system is specially designed for children with caregiver assistance, a center-of-mass, tilt-in-space, full-featured model with head support for a child with a higher-level disability and provides maximum comfort and stability. 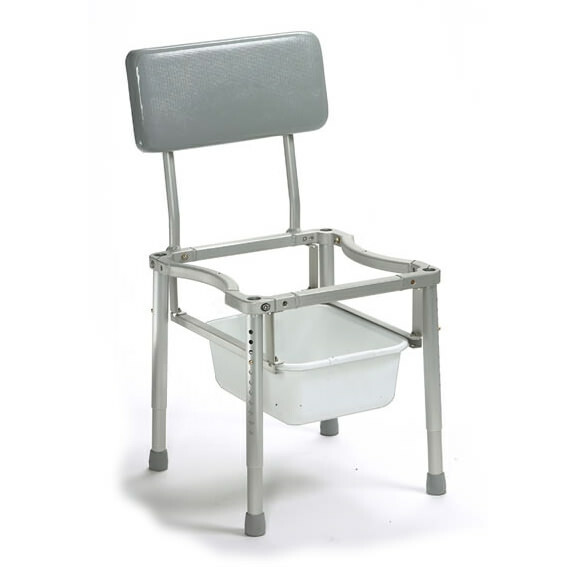 Nuprodx multichair 6000tilt is a commode chair, tub access slider system, and in-home mobility chair in one complete unit that requires just one bedside transfer and eliminates the need for transfers onto toilets and into tubs in the dangerous bathroom environment. 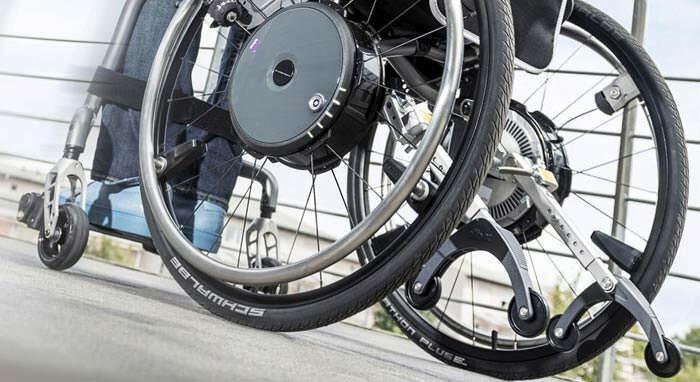 Nuprodx MC6000tilt pediatric is safe and convenient for user and caregiver as it includes the smoothest rolling transfer system available on the market. 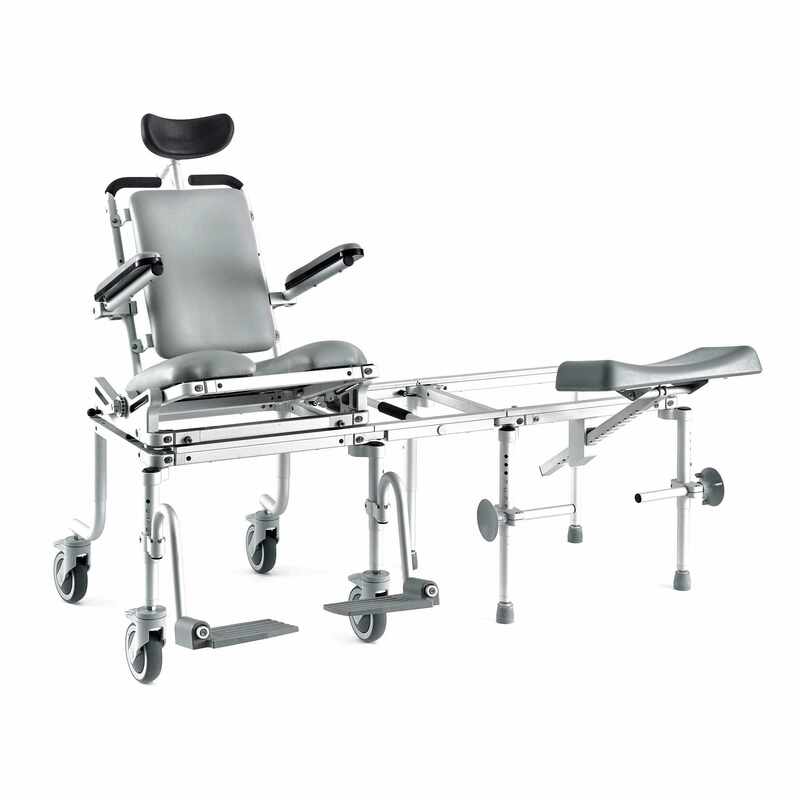 Multichair 6000tilt pediatric tub slider system comes standard with adjustable padded head rest, flip-up cantilever arms, adjustable swing-away footrests and tilt-in-space system with rack and pinion hand crank for added safety and comfort. Approximate product weight 66 lbs. A. 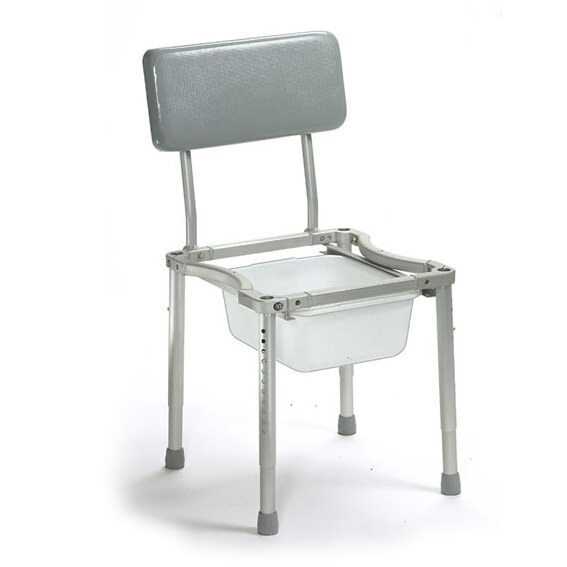 Overall height 38.5" - 42.5"
C. Overall width (chair only) 22.3"
D. Inside clearance (chair only) 16"
E. Floor to seat 22.5" - 26.5"
G. Seat frame to floor 16.5" - 20.5"
H. Seat to footrest 12" - 20"
I. Tub base clearance (outer clearance) 15.5" - 21.5"
J. 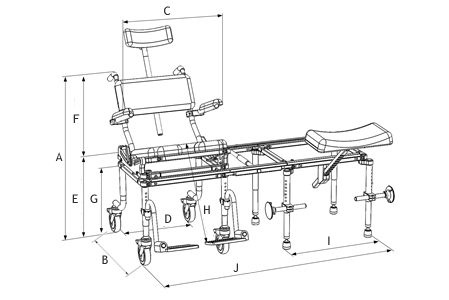 Overall width (slider systems) 46" - 48.5"
Two-years limited warranty for all parts except cushions. One-year limited warranty for the cushions. The warranty period begins on the date you receive the chair. 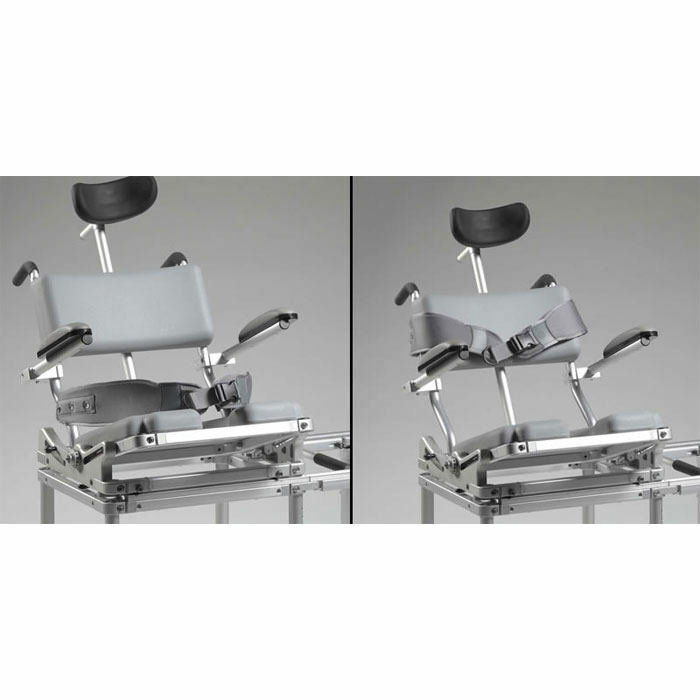 The chair will be repaired or replaced at the discretion of the manufacture with no charges to you for parts and labor, provided you have proof of purchase and of purchase date. Manufacturer makes no warranty of fitness for your particular purpose and no warranty of merchantability beyond that already stated. 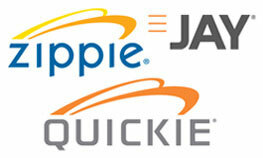 No warranties extend beyond the duration of the express warranty stated above. 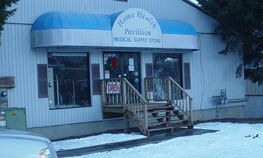 The only obligation of manufacture is to provide the purchaser with free repair and replacement as described above. 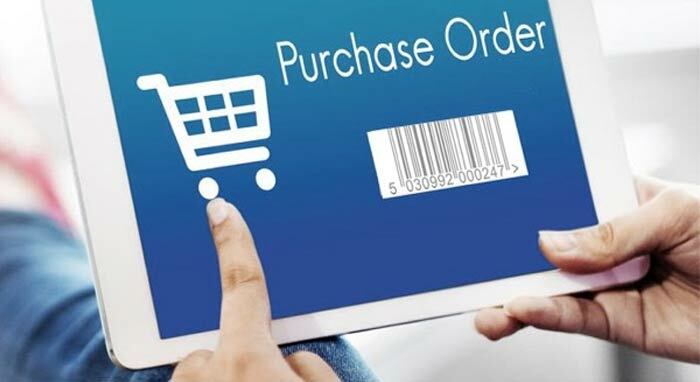 This exclusive warranty remedy will not have failed as long as the manufacturer is willing and able to repair or replace as described, but if this remedy should be held to have failed, the only remaining warranty obligation of manufacturer shall be to refund the acts beyond its control. This warranty does not apply to problems arising from normal wear, improper operation, improper maintenance, improper storage or use of product other than the purpose it is intended for.